WASHINGTON — As the top American military commander who oversaw the Middle East and Central Asia, Gen. David H. Petraeus worked hard to court the political elite in Kazakhstan. So the first time he met there with President Nursultan Nazarbayev, he made a joke to dispel fears that the United States had designs on the region’s oil. “We could have bought all the oil in the region for 100 years for what we’ve spent in Iraq!” the general said. Today, General Petraeus is Citizen Petraeus, a new partner in KKR & Company, a New York private equity firm. Last month he was back in Kazakhstan, this time courting the business elite at Nazarbayev University, founded by the Kazakh leader. The trip, with Henry Kravis, KKR’s billionaire co-founder, is a window into the lucrative life that Mr. Petraeus stands to lose as he faces a possible criminal indictment two years after an extramarital affair cost him his job as director of the Central Intelligence Agency. These days he keeps a far lower profile in a capital where he was once celebrated as the greatest general of his generation. F.B.I. agents and Justice Department prosecutors have recommended that Mr. Petraeus face trial on felony charges of disclosing classified information to his biographer and lover at the time, Paula Broadwell. Mr. Petraeus has denied the charges. But if Attorney General Eric H. Holder Jr., or his successor, pursues an indictment, Mr. Petraeus, 62, could end up in prison. Despite the investigation, Mr. Petraeus is still having quiet conversations with the White House. The National Security Council has reached out several times to the former C.I.A. chief since the summer, an administration official said, and Mr. Petraeus responded with advice on Iraqi politics and how to counter the Islamic State. But he has declined to testify before Mr. McCain’s committee, the senator said. Outside Washington, he remains more active. Mr. Petraeus, who declined to be interviewed, turned up in June at the Aspen Ideas Festival, where he told CBS’s Bob Schieffer that his KKR job was “like being director of the C.I.A. for a global financial firm, with a lot smaller staff.” He appeared at the 92nd Street Y in Manhattan in October to help an old Army friend, John A. Nagl, promote his new book on Iraq. And he spent a week in November at the University of Southern California, where he caught up with former President Bill Clinton and led R.O.T.C. cadets on an early-morning jog. Back in town last month, he mingled with the heavily Republican crowd at the annual Alfalfa Club dinner, a crusty, off-the-record Washington social and political event. Friends say it is a long way from his old life as commander of American forces in Iraq and Afghanistan when those wars were at their low point, and as the overseer of American military operations in the Middle East and Central Asia when he was the head of United States Central Command. Mr. Petraeus joined KKR in May 2013, six months after leaving the C.I.A., at the urging of Mr. Kravis. Within the firm, Mr. Petraeus runs what is described as a small research division, the “KKR Global Institute,” which analyzes public policy and strategic risks and advises the firm on investment decisions, colleagues said. But private equity experts said his real value was his Rolodex. When Prime Minister Shinzo Abe of Japan was in New York for the United Nations General Assembly in the fall of 2013, he made time for Mr. Petraeus, a nugget the former general slipped into a video interview with David Snow, founder of PrivCap, which follows the private equity business. “We are watching Abe-nomics, obviously, very closely,” he said then. When Sidney E. Goodfriend, a retired Merrill Lynch investment banker who founded an organization to mentor veterans, wanted Mr. Clinton to film a public service announcement for the group, he talked his way into a meeting with the former president by promising to bring Mr. Petraeus. Mr. Clinton filmed the spot. “It wouldn’t have happened without David,” Mr. Goodfriend said. Mr. Petraeus, who has a Ph.D. in international relations from Princeton, has always regarded himself as the thinking man’s general. Friends say that he found leaving the C.I.A. as he did humiliating, and that he spent the first weeks in virtual isolation at home. “One foot in front of the other, one day at a time,” Peter Mansoor, a military historian who was Mr. Petraeus’s right-hand man in Iraq, recalled Mr. Petraeus as saying. He hired Robert E. Barnett, the Washington lawyer who doubles as a book agent and career counselor to the city’s powerful, to plot his comeback. 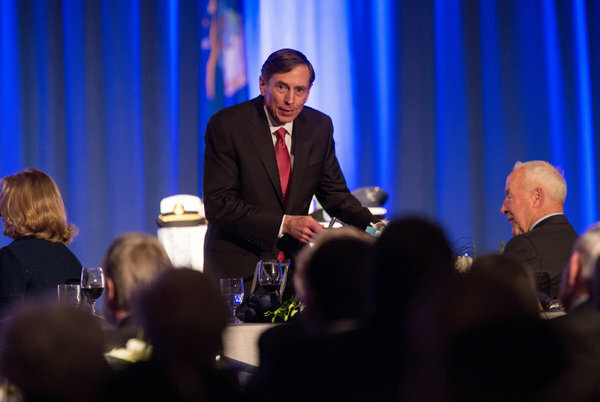 Since then, Mr. Petraeus has sought to carve out a new voice for himself as an expert on North America and energy, which has formed the backbone of his work at KKR, in academia and as a paid public speaker. In upbeat opinion articles — including a recent Washington Post piece with the headline “America on the Way Up” — Mr. Petraeus argues that new technologies like fracking give the United States, Canada and Mexico a competitive edge. He is bullish on Mexico, which is ending its state-run monopoly on oil production, and made four trips there in 2014. Mr. Petraeus has not changed his lifestyle, at least not noticeably. He has remained in the same house on the same street of $1 million to $2 million homes in the Northern Virginia suburb of Arlington with his wife, Holly, and commutes by Amtrak train to KKR’s offices on the 42nd floor of a Manhattan skyscraper with a sweeping view of Central Park. On Thursday he spoke at Trinity College in Dublin, where an antiwar protester who confronted him was taken away by the police. Mr. Petraeus is affiliated with three universities: Harvard, where he goes roughly once a month for a project on North America, earning $1,000 each day he is there; U.S.C. ; and the City University of New York, where he teaches a seminar on North America to students at the Macaulay Honors College, for a salary of $40,000 a year, said Ann Kirschner, the college dean. It is a raise from $1 a year, which Mr. Petraeus agreed to accept in 2013 when plans for a $200,000 salary financed by a donor caused outrage among the Macaulay faculty. C.U.N.Y. students know “Professor Petraeus” as a tough editor. He requires papers to be written in the style of memos to a White House chief of staff, conducts mock congressional hearings on issues and hands out copies of “The Elements of Style,” by Strunk and White, on the first day of class. “He taught us how to cut out flowery language and get to the point,” said Erika Larsen, 21, a senior. What happens next for Mr. Petraeus is unclear. David E. Kendall, his lawyer on the criminal matter, refused to comment on the investigation, as did officials at the Justice Department.